Fontana, Calif. - The City of Fontana Housing Department is looking for applicants for its Housing Rehabilitation Program. 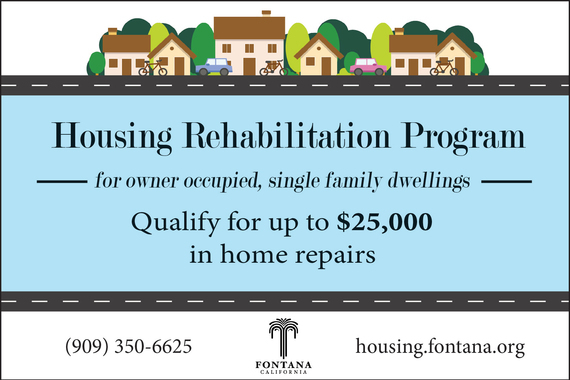 The program provides grants and zero interest deferred loans up to $25,000 for the rehabilitation of owner occupied, single family dwellings in Fontana. Eligible repairs include paint, window and door replacements, air conditioning systems, roof replacement, new flooring, kitchen cabinets and bathroom remodels. In order to apply for the program, you must complete the application and submit it along with the required documents to the Housing Department. For more information, please call Valerie Gonzales at (909) 350-6625 or visit www.fontana.org.